GEO ExPro - An Improved Future for the Bakken Shale Play? Non-core Bakken acreage was highly price elastic in 2014 and 2015. When oil prices dropped, the rig count went into absolute freefall. More than 100 rigs were stacked in the Williston Basin alone in just a 12-month period. Rigs have come back as core infill opportunities still exist in McKenzie, Williams, Mountrail and Dunn counties. Breakevens in these areas are as low as US$38/bo because of new well designs and better cost structures. Improved economics and new pipelines helped turn Bakken production around in 2017. But that's only part of the rebound story. We need to look at acreage further west, too. 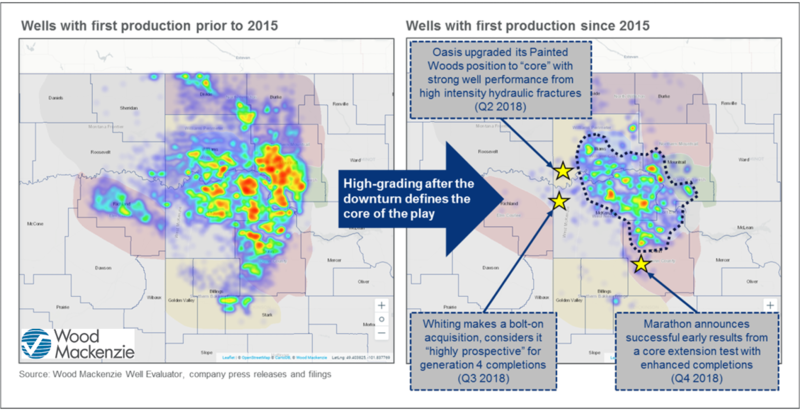 Heat maps of the Williston Basin demonstrate focused drilling activity. Source: Wood Mackenzie Well Evaluator. In the subsurface, Bakken core acreage benefits from a combination of robust oil-in-place and highly brittle rock which is conducive to hydraulic fracturing. The core is also deeper, with higher reservoir pressure that improves production rates. From a type curve perspective, the Bakken core competes with the top Lower 48 tight oil plays. For eastern McKenzie County, we estimate single well recovery of 625 Mboe (68% oil) from the Bakken Formation, over 30 years. The leading sub-plays continue to breakeven below US$50/bo. Bakken drillers' focus on the core drove results; well productivity surged following the downturn. In addition to high-grading wells in the best acreage, operators fine-tuned completion designs. The outcome was staggering: Bakken production hit record-highs throughout the second half of 2018, reaching 1.34 MMboe/d in October 2018, according to Wood Mackenzie Well Evaluator. Activity is now emerging again along the western and southern edges of the Bakken play. Stronger oil prices in 2018 drove a few operators to test modern completion designs in non-core acreage. Initial results were encouraging. Marathon: Preliminary tests of the four-well Ajax pad are giving Marathon confidence to extend the core southward. Early Middle Bakken production results yielded an average 30-day initial production (IP) rate of about 2,400 boe/d with 84% oil. Whiting: The Foreman Butte asset acquisition, west of the core, was called "highly prospective." The company plans 17 wells this year with more flexible Generation 4 and 5 completions that aim to optimize induced fracture size depending on geology and existing well spacing. Oasis: Just north of Whiting's acreage, Oasis upgraded its Painted Woods position to "top tier" after promising well results from high-intensity hydraulic fractures. Subsurface maps indicate locally high oil-in-place volumes in this area. As the Bakken play matures, the fringe production trends will play an important role in future output growth. Non-core performance improved substantially since the downturn. Average 30-day IP rates have increased year-on-year, rising 78% since 2014. Wells drilled in 2018, however, saw much steeper declines, suggesting potential drainage by older wells in these lower reservoir quality areas. We are continuing to monitor non-core performance changes, factoring this into our type curves and long-term supply forecasts. Analysis using Wood Mackenzie Well Evaluator revealed this emerging new trend in 2018. Our play intelligence, coupled with our cloud-based analytic platform, is designed to provide our clients with the top tier technology in valuations and benchmarking.